I was sitting with my colleagues in a small boat near the mouth of the Atchafalaya River, a distributary of the Mississippi. We had boarded at the dock, traveled south through the channel, and were now bobbing in open water where the murky Atchafalaya River meets the clear waters of the Gulf of Mexico. I figured our guide was making a joke – there was no way I was jumping out of the boat. But without hesitation, my colleagues jumped – and were suddenly standing in knee-deep water. While it appeared we were sitting in deep, open water, it was actually very shallow. Beneath our boat, there was about a foot and a half of water, and under that, mud and dirt. Soon, that mud and dirt would emerge above the water line as wetland grasses would take hold and start to grow. These grasses and roots would in turn continue trapping more mud and dirt, continually growing taller and thicker. I climbed out of the boat and was standing on some of the newest land in North America! It was one of the coolest things I had ever experienced. I’m not actually from Louisiana. I was born and raised in St. Paul, Minnesota, along the Mississippi River – more than 1,200 miles from the Louisiana coast. From an early age, my family instilled in me a love of nature and the outdoors and, as a kid, I wanted to grow up to be a national park ranger. 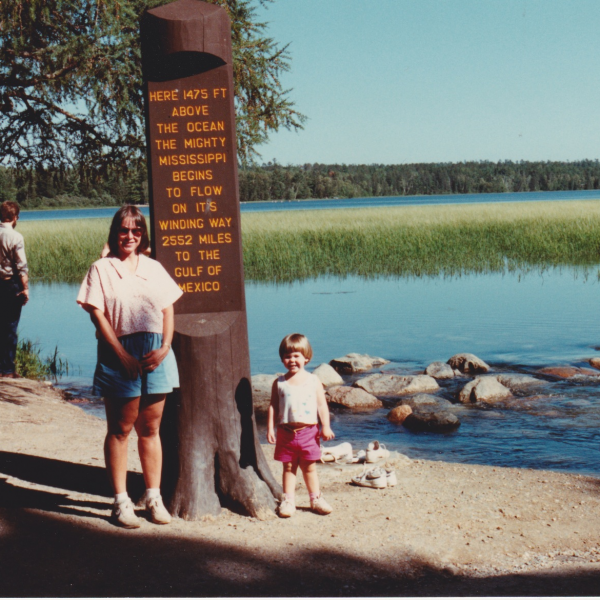 A rite of passage for any Minnesotan involves a trip “up north” to Itasca State Park. Among the towering pines and calling loons, along the shore of Lake Itasca, there is a small stream with stepping stones. Walk across these stones and you’ve crossed the headwaters of the Mississippi River. From here, the mighty Mississippi begins its 2,522-mile journey south to Louisiana and the Gulf of Mexico, picking up water and dirt from Midwest farms along the way and depositing it in places like the Atchafalaya River’s Wax Lake Delta. Standing in the warm knee-deep water, I remembered being a kid and walking across those headwaters. I thought about how far the river water and sediment swirling around my feet may have traveled. I imagined the wetlands that would grow in this place, fueled by the dirt and fresh water of the Mississippi River. And in that moment, I felt a connection to Louisiana’s coast and knew it was a special place I wanted to help protect. #OurCoast is an ongoing project by Restore the Mississippi River Delta to document the various ways the Mississippi River Delta has made an impact in the lives of Louisianians and others. Learn how you can contribute here or fill out the form below. Tell Your Story: What Does the Coast Mean to You? This can be a specific memory of the coast, a description of a favorite place, an explanation of how the coast enriches your life or business – really whatever you choose!